FANBOY PLANET.com . : mc-backtothefuturefarewell :. Farewell To The Future ...For Now! On Labor Day, the future ends at Universal Studios Hollywood. That would be the Back to the Future ride, anyway, which will shut down after more than a decade of service and yes, I'll stoop to the cliché, delighting park visitors. If you haven't checked this attraction out, you only have weeks left (the Florida park's version closed in March), and if you're a theme park junkie (like myself), you should catch this one before it's gone. To honor its last month, Universal held an event last Thursday, August 2, in front of the ride. 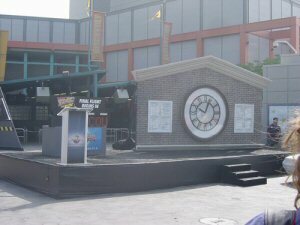 A replica of the famous Hill Valley clock tower, much lower to the ground, sat in front of the attraction while press and fans gathered. Among those in the crowd, according to a Universal spokesperson, were over seventy DeLorean owners eager to be part of the farewell. Of course, only one DeLorean truly mattered. Though Universal had one under wraps near the tower, everyone waited for the actual car that could travel through time. After Bob Gale, co-creator of both the films and the ride, thanked the crowd for their support, that car came roaring around the bend. It's like looking into a mirror! While the crowd had been promised Christopher Lloyd, the driver turned out to be one heck of a good Lloyd impersonator. Only at a theme park can an actor and his fictional alter ego stand side-by-side to mark a milestone in the character's life. The Doc Brown that drove up played well to the crowd, imitating Lloyd's whispery shout to perfection before introducing his passenger in the DeLorean: Lloyd himself. 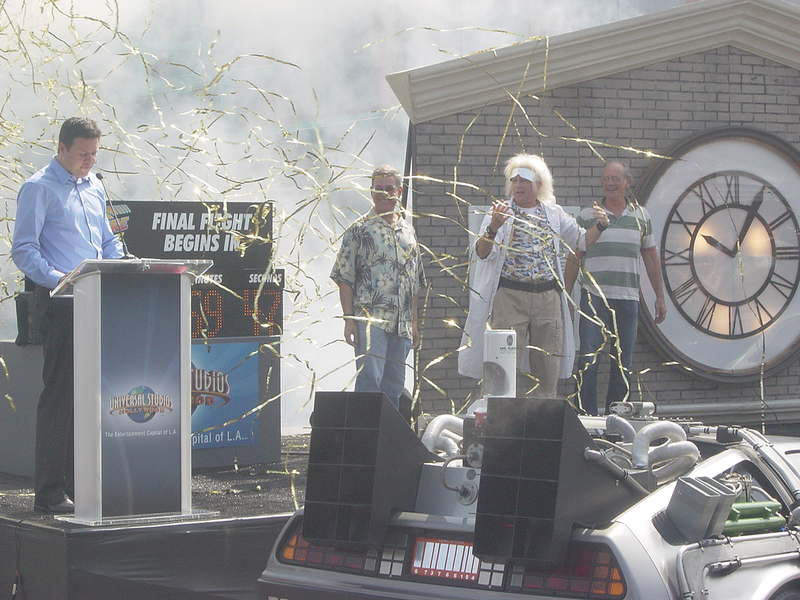 As the park spokesperson welcomed Doc Brown, the character realized it was a few minutes past 10:04. "If we don't connect the past to the present," he twittered, "we may not have a future!" Grabbing Gale and Lloyd, the wild-maned scientist handed them power cables in order to launch the ride. Brown himself held the power converter, and as the three came together, smoke exploded from behind the clocktower. Soon all were covered in ribbons of mylar, and Gale in particular looked amused by the whole thing. And so the countdown had begun. The park spokesperson looked over at the trio and invited them for one last ride (audio file here). As they walked off together, Lloyd turned and waved to the crowd, appearing to be touched by the fandom. The ride itself didn't actually go into operation for a few more minutes, the better for press to swarm all over that DeLorean. One nice surprise came in the form of Claudia G. Wells, who had played Marty McFly's girlfriend in the first film. Owner of a men's clothing store really just down the street from Universal Studios, she showed up for the festivities and posed in the passenger seat of the car. What, you might ask, about the ride itself? Its closing will be a loss to ride fans. Hands down, this is one of the best storytelling rides around. Audiences queuing up get an entire plot handed to them on television screens at the Institute of Future Technology. If you've never seen the films, it doesn't matter. Doc Brown (Lloyd) introduces himself, and occasionally the video cuts to Thomas F. Wilson's Biff Tannen sneaking around trying to find a DeLorean to steal. The set-up even introduces the ride vehicle, the unlikely eight passenger time machine. without ever losing the plot. A video screen in the car cuts back and forth between Doc Brown offering encouragement and Biff in the DeLorean ahead of you to keep moving the story along with the spectacle. It really needs a couple of rides to take the whole thing in, which is the mark of a good attraction. That's one thing to be said about Universal Studios Hollywood in general; they don't have a lot of room for a lot of rides, so what they put in are all definite E Tickets. Everyone has to do the tour at least once, and the park has done a good job of freshening it up over the years. I miss the Battlestar Galactica attack, though. The other rides are top-notch. Revenge of the Mummy is one heck of a great rollercoaster, and Terminator 2: 3-D set the bar years ago for integrating storytelling with thrills. Heck, even the Waterworld stunt show should be seen - if only because it's so well done it makes you think the movie might be worth watching. Back to the Future: the Ride will close on September 3, to be refurbished into The Simpsons. Before you visit America's favorite family, you need to say farewell to this.